Good evidence for the dress of the Legion is weighted towards the later period of its existence. So before their transition to Hussars, what did the three regiments of Light Dragoons wear? To begin with, let’s decide what they didn’t, by unpicking a couple of modern sources. (For details of sources mentioned, see page 1.) Click to enlarge images. In the text of his 1974 Osprey book Otto von Pivka states that the 1st Light Dragoons at their formation wore the uniform of the Hanoverian 9th Cavalry, a blue kollett (cavalry jacket), while the 2nd and 3rd wore “the normal British light dragoon uniform which later was of the hussar type,” but including “initially” a dolman. The facing, lace and button colours given for all three are those familiar from the later, Hussar period. By 9th Cavalry, does he mean the Hanoverian 9th Light Dragoons? If so, why that regiment? It’s all a bit confusing. Hofschröer (1989) follows this uncritically. von Pivka and Schäfer – plain wrong? The confusion is compounded in von Pivka’s plate of a man of the 3rd regiment dated to 1809, “based on a sketch by Knötel”, in a Tarleton and what appears to be the light dragoon jacket of post-1811 with epaulettes, though, oddly, with a white edging to collar, lapels and cuffs. The Tarleton is shown with a dark blue turban and white over red plume. This is the uniform, states von Pivka, worn by all three regiments “until 1813” in their varying facing colours. John Grehan’s book, a compilation from uncredited sources, follows this but admits to some “ambiguity” by attributing the lapelled jacket to the 1st and 2nd, though not the 3rd. Despite the discrepancies in detail and dating, these two images both clearly draw on the same “sketch” by Knötel, which I’ve not yet been able to locate. The jacket shown post-dates the periods given by several years, so these figures are clearly impossible; what was Knötel thinking of? Did he confuse the two KGL Light Dragoon regiments of 1813 (ex Heavy Dragoons), who did wear this jacket, with the three regiments raised in the previous decade? If not, my reluctant conclusion is that Knötel’s “sketch” was from a written source giving a “light dragoon jacket”, and that he simply picked the wrong jacket. His source must have mentioned lace, but as the post-1811 jacket has no lace, he put the “lace” in as an edging to the facings. No other explanation makes sense. In short, there seems to be no reason to think that the three regiments wore anything but the looped British light dragoon skirtless jacket, or dolman, of the period; the von Pivka and Schäfer images are anachronisms, good examples of how, with repetition, a misapprehension can get cemented into the record. Schäfer and Chappell – better, but how about the yellow lace? 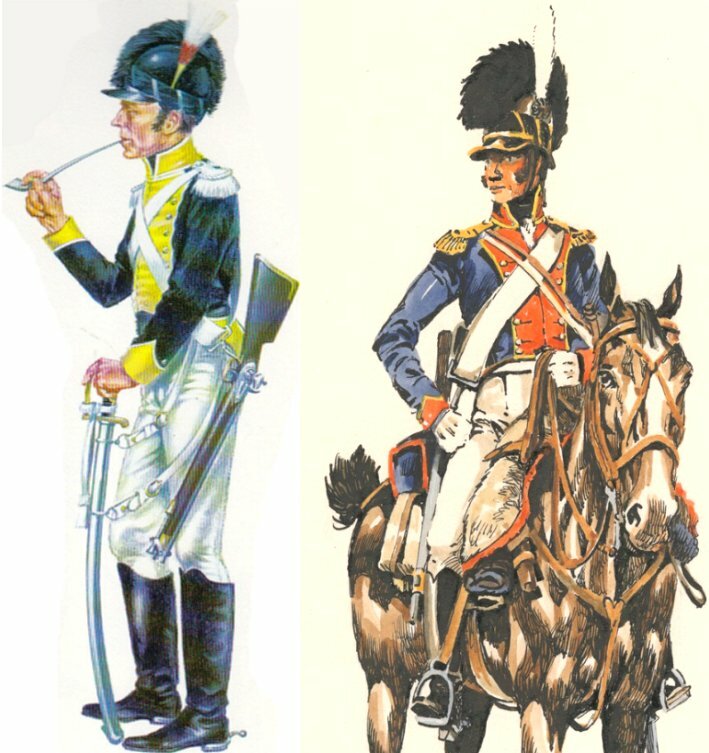 Conversely, Mike Chappell rightly concludes that “from their formation the King’s German Dragoons wore a similar uniform to that of the British dragoon regiments.” Accordingly, his plates include a private of the 2nd Light Dragoons of 1805, in a light dragoon jacket with white facings and yellow looping, and a Tarleton with black turban and white over red plume. But two words of caution: first, again, where do the Tarleton details come from? Secondly, British light dragoon jackets were invariably laced in white/silver, and yellow/gold lace for two of the British hussar regiments did not appear until 1811 and 1814. We know from the Meyer ledger (see pages 6 & 7) that the 1st and 2nd KGL Hussars were laced in yellow/gold by 1809, but how far back before that year can we afford to assume that that was also the case? To sum up: images featuring the later lapelled jacket are simply wrong; colours of Tarleton turban and plume are, to the best of my knowledge, unproven; yellow/gold lacing on jackets of the 1st and 2nd Light Dragoons/Hussars before 1809 is also , to the best of my knowledge, unproven. As for the transition to hussar styling, John Mollo in The Prince’s Dolls (1997) states firmly that “… the 1st and 2nd Light Dragoons of the Legion seem from the first to have been dressed as hussars.” However, in his Waterloo Uniforms 1: British Cavalry (1973) he cites a War Office letter of 1810 on first dates of issue of hussar clothing. This gives 1807 for the four British hussar regiments, but 25 December 1803 for the 1st KGL, and 25 December 1806 for the Second and Third. But is this the correct interpretation? 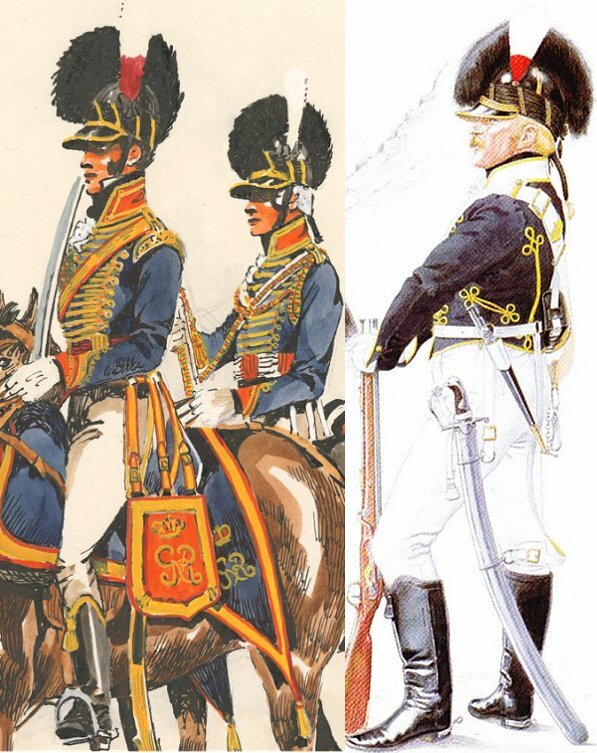 Hofschröer alleges that the 2nd and 3rd regiments wore hussar uniforms from their formation, while Mike Chappell limits this to the 3rd, raised in early 1806. Take your pick! The 18th of January, 1808 (being the birth-day of the Queen), the dragoon regiments were drawn up on parade, previously to which, however, jackets trimmed with fur had been distributed, which gave our men the appearance of Hussars. From this it seems reasonable to take the close of 1807 as a date for the issue of pelisses and the Hussarification of the three regiments, possibly earlier in the case of the 3rd.